D3 Engineering has announced the release of its new DesignCore sensor interface card for the NVIDIA Jetson AGX Xavier Developer Kit. 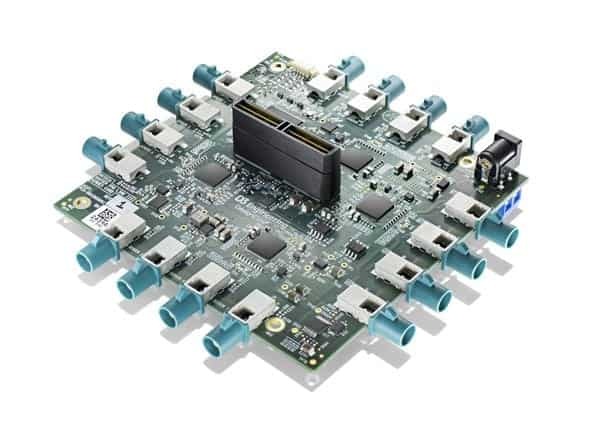 The new card allows engineers to quickly connect multiple cameras or sensors with their NVIDIA Jetson AGX Xavier Developer Kit to access its full power for system development of AI applications such as unmanned aerial vehicles (UAVs) and other robotic platforms. Sensor data is delivered via a serial link and is de-serialized into MIPI CSI-2 data for consumption on the Jetson AGX Xavier Developer Kit. This allows the sensors to be placed up to 15 meters away from the processing unit. GPIO and I2C control are available for configuration and reset. An on-board FPGA provides hardware-level synchronization capability. D3 Engineering provides cameras, radar sensors, and software design examples for use with the interface card. The company also offers engineering design services to interface other sensors or create new Jetson AGX Xavier-based designs to meet OEM requirements. “With expertise in embedded vision and sensor system development, and a deep understanding of the Jetson platform, D3 Engineering can help NVIDIA customers get advanced products to market more quickly on the Jetson AGX Xavier platform,” said Murali Gopalakrishna, head of product management, autonomous machines at NVIDIA. D3 Engineering is an NVIDIA Jetson Preferred Partner for camera development. This partnership provides access to the Jetson camera toolchain, which enables D3 to deliver high-performance, cost-optimized embedded vision systems on the Jetson platform.